I went to the feed store yesterday and when I walked in, there were two beautiful, large web footed birds in a big enclosure at the front of the store. “Hello, geese,” I said as I passed. “Duck!! !” shouted the young man behind the counter. I jumped, startled — and craned my neck upward to see what was about to come raining down on my head. He said, “Ducks! Those there? They’re ducks. I heard you call them geese.” I thought I knew the difference between ducks and geese, as my neighbor has two geese as pets — I see them every day and occasionally care for them when she’s out of town but apparently I’m not the avian expert I consider myself to be. 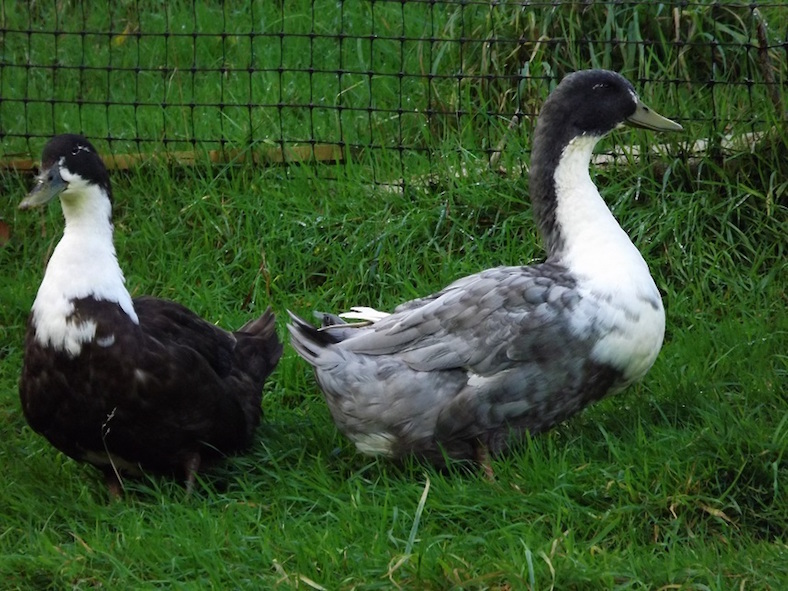 These looked bigger than most ducks I’ve encountered and were mottled black and white, very striking in appearance. They were Pomeranian Ducks, it was explained to me and apparently not exceptionally common. They seemed like pleasant enough birds and the clerk tried to tell me that they were rescues — a local farmer had bought two, didn’t exactly monitor them carefully and ended up with sixteen or more. He was now parting with some — which sounded to me more like inadequate family planning than a typical rescue situation. “You should take them home,” he said as he ended his spiel. “I’ll give you a good deal on the both of them — we want them to stay together.” I have a terrier that might do a credible Hannibal Lector impersonation in order to enjoy foie gras and I declined. Their enclosure at the store was actually very nice — it was spacious and clean and the ducks had food and water but still, I wanted to take them away and let them roam around my yard, happily quacking together forever. I thought about them all the way home and obviously, I’m thinking of them still.